The need to improve girls’ lives by ending child marriage and teenage pregnancy had us in Eastern Uganda this previous week. We drew roadmap stretch over the districts of Butaleja, Mayuge and Iganga with the aim of devising sustainable ways of ending child marriages and teenage pregnancies. Butaleja, our first destination, had us kick off with different dialogues for different groups which included the youth, religious leaders, community leaders and parents to gather their take on under-age marriage and teenage pregnancies in the district. They later presented their ideas, each group committing to do something with immediate effect; uniquely, they found very similar causes like parental negligence, engagement in business and wrong peer groups. Religious leaders committed to spread the message more in places of worship, parents promised to pursue family planning, while the youth pledged to abstain. We then travelled to Mayuge on December 2nd,where we were hosted at the Town Council Headquarters for our second dialogue in the region. We got insightful discussions from the locals of the area on teenage pregnancy and under-age marriage. “Some girls carry two sets of clothes in their bags as they leave home for school. They then go and change, see their boyfriends and then change back and go home. The parents can never know” Mr Kasinda Musa, a resident of Mayuge noted as he put the blame on the shoulders of the girls. He then called upon them to be more careful with their lives, as such ventures can easily end in teenage pregnancies. The parents too were called upon to bridge the gap between them and their children, and the whole place burst into ululation when the youth pledged to champion the drive to bridge this gap. Among other noteworthy takeaways from Mayuge were the institution of home cells by religious leaders to preach morality to the youth during holidays, providing pads and scholastic materials for girls by parents and the addition of incentives to youth clubs to encourage more to join to keep them busy. 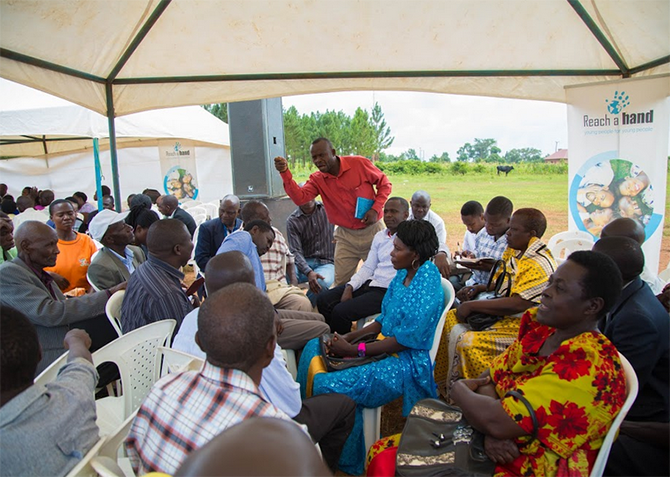 Our final destination was Iganga, where we held our dialogue at the District Headquarters. The cultural leaders appreciated us for taking the step to call them to address such issues, saying it was a good showing from youth being interested in fellow youth than waiting for elders to take the initiative. Police too thanked us for the dialogues, applauding them as a solution to a big problem. The umbrella cause of parental laxity was once again stressed out here, and parents vowed to pull up their socks. They also promised to hold periodic talks with orphaned children, to give them the parental guidance they have been denied. It was interesting to see how closely linked the ideas were from the various districts, demonstrating that they were affected by these issues in similar ways. We promised to make a return visit to the region after six months, and we left, very appreciative of the ideas discussed, and seeing a very bright light at the end of the road for the girl child.